Hay Hay It’s Donna Day #4: Brilliant Bruschetta! It’s been some time since I participated in Sugar High Friday, which is graciously hosted this time by Sarah at The Delicious Life. Frankly, my Fridays tend to be Wine High Friday after my crazy work weeks as of late. Plus, it’s just too darned hot to be baking stuff. Thankfully, the theme for this SHF is frozen and frosty creations. I found my recipe for SHF while running on the treadmill – too hot to be running outside, ya know? On the back page of this month’s Food and Wine magazine was a trio of fruit based granitas. Each of them had a spicy twist that made them all sound terribly interesting. I chose to make the Honeydew Granita. The recipe called for a touch of cinnamon to be added but I twisted it up and added a pinch of ground ginger. It worked really well with the granita, which couldn’t have been easier. Sure, you have to flake the granita every 20 minutes or so with a fork…but you’re inside in the AC anyway so whats a few minutes standing in front of the freezer with the door open? – In a small saucepan, stir the water and the sugar over low heat just until the sugar melts. Let cool, then transfer the syrup to a blender. Add the honeydew chunks, lemon juice, and cinnamon. Puree. Transfer the puree to a shallow plastic container and freeze until frozen around the edges and slushy, around 30 minutes. – Using a fork, stir the granita every 20 minutes or so, until its completely frozen into a mass of fluffy ice shards, about 1 1/2 hours. Just before serving, fluff with a fork. 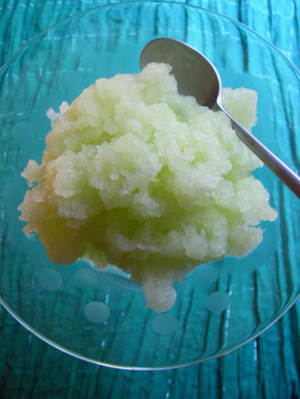 If the granita becomes too solid, chop into chunks and puree until fluffy. we don’t have AC in San Francisco, so the idea of the freezer open isn’t a hardship at all when it’s so hot! Cool.. and I mean cool…. Nice Tami, it looks delicious. Now that’s how it’s done!